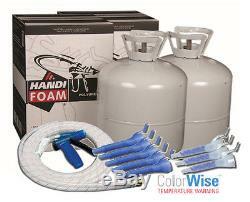 Spray Foam Kit 605 - Closed Cell, Quick Cure. These spray foam insulation kits are perfect for insulating and air sealing. These 2-component Quick Cure, Closed Cell polyurethane foam kits are available in three different sizes (105, 205 and 605) to meet your insulating needs. Each kit comes with foam, hoses, gun, and extra tips -- everything you need to get started foaming. Stored in Temperature Controlled Warehouse. Chemicals guaranteed to be properly in solution when it ships from our facility due to proper storage temperatures (typically kept at 75 - 85 degrees). 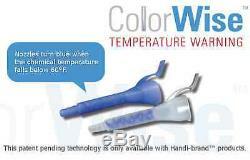 Colorwise nozzles turn blue during spray as a warning if cold temperatures are encountered. Variable-Rate Output Trigger on Gun -- variable output flow based on how much you depress the trigger on the gun. Fan and Cone nozzle types. HANDI-FOAM® is a multiple purpose two-component low pressure polyurethane froth foam utilizing a non-flammable blowing agent to assist in the safety of the end user. The pre-pressurized, portable two-component froth systems are dispensed through the state-of-the-art Handi-Gun® froth dispensing unit, providing unsurpassed quality and flexibility in end-use performance. You are purchasing 2 brand new, 605 board foot kit of Quick Cure, Polyurethane, High Density, Closed-Cell spray foam. This combo kit will include 2 Component A Tanks, 2 Component B Tanks, 15 ft Hose Set, Dispensing Gun, 16 extra spray nozzles, petroleum jelly, wrench for tightening hoses, and operating instructions. ENERGY EFFICIENT SOLUTIONS IS AN INDEPENDENTLY OWNED AND OPERATED DISTRIBUTOR OF HANDI-FOAM® AND ITS RELATED PRODUCTS. THESE PRODUCTS ARE INTENDED FOR PROFESSIONAL USE ONLY. Full Cure Time: 1 hour. Closed Cell: Yes (The only foam that truly stops water and air infiltration). R-Value: Minimum of 6.2 per inch. Other Online Docs: Operating Instructions Data Sheet MSDS-A MSDS-B. 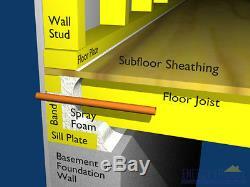 Keys to Using Disposable Spray Foam Insulation Kits. Note: The following instructions are not unique to Handi-Foam Spray Foam Kits. All brands of SPF Kits have similar requirements to those listed below, and special precautions must be taken when spraying spray foam insulation. · Temperature - All SPF kits need to be conditioned to the proper temperature prior to use. In general, optimal core temperature is 75-85 F. The single most important factor is maintaining proper core temperature. Temperatures affect both the viscosity of the liquids and pressures in. Failure to maintain temperature within the acceptable ranges will result in inconsistent foam and lower yields. If your tanks have arrived. Off the truck cold it can take several days for the chemical to reach room temperature. · Handi-Foam kits come with a gun with a variable rate trigger which means that you have the ability to control the output volume of the foam. Start out with only 1/2 to 3/4 trigger pull. More trigger pull equals more output. · Remove each tank from its box and rock back and forth on one bottom edge for at least 2 minutes. · Whenever you stop spraying for 30 seconds or more, you will need to replace the nozzle. Failure to do so may result in damage to. · A small test sample should be sprayed into a trash can without a nozzle prior to using the kit in the final application. Look for 2 steady streams. Then, during product application, look for firm, pale-yellow colored foam. Anything brittle or runny is off-ratio foam. AND CALL if you encounter anything other than very hard foam. · The tanks must remain in the upright position (valve at the top) while spraying foam or yield issues can occur due to off-ratio spraying. Placing each tank in its box will help to keep it upright. · Leave a cured nozzle on the gun after use for storage. This provides a seal for the hoses and gun so that air does not seep into the. Hoses (which could potentially cause a slight hardening of one component or the other inside the hoses). If this is not done, it is possible. To experience some yield issues with the foam or potentially even cause a complete blockage in one hose. Purge hose/gun for 15 seconds. Every 7-10 days of storage between uses to keep the foam in the hoses fresh, leaving the spent nozzle tip on the end of the gun after each. · Apply foam in 1-2 lifts. · A pply foam in 1-2 layers per pass. 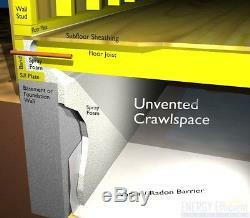 If more than 1-2 is applied at one time, the foam is compacted during spraying which can. Foam sprayed thicker than 2 per pass will have a higher density and therefore will cover less square footage. · Liberally Apply Petroleum Jelly. · Liberally apply petroleum jelly to the face of the gun. There can never be too much. · Open Valves 100%, Close when not in Use. Sensitization may become apparent through coughing, pulmonary secretions, chest pain, breathing difficulty and/or asthma. For these reasons, when using two component polyurethane spray foams we recommend following or participating in a respiratory program. All HANDI-FOAM® two-component polyurethane spray foams should always be used in conjunction with a certified respirator program in addition to safety glasses or goggles, nitrile gloves, and clothing that protects from skin exposure. Required respirators must be NIOSH approved and medical evaluation and training must be attained before use. NOTE - As is the case with any polyurethane spray foam kit, UPS typically does not accept this package from you unless you as the shipper have proper HAZMAT certification and are a registered HAZMAT shipper. About Energy Efficient Solutions & ICP Adhesives and Sealants. Energy Efficient Solutions has been a market leader in energy efficiency for both residential and commercial applications since 2002. Our expert staff includes a BPI-trained expert in building efficiency and an engineering graduate with close to a decade working with foam, and we are more than capable of solving the toughest energy efficiency problems. HANDI-FOAM® is backed by ICP Adhesives and Sealants, Inc (changed recently from Fomo Products) which is one of the largest and most trusted companies in the industry. 2 Handi-Foam Quick Cure Foam Kit, 1210 square feet at 1 inch thick. (2 Component A, 2 Component B, 1 Hose, 1 Gun, and Tips). Spray Foam Insulation kit worked great. Easy to use & great results. Received product quicky and in good condtion, good experience. Item arrived just as described, a pleasure to do business with. Easier to use than I thought. Great communication, Item as described. Very fast and item as promised. 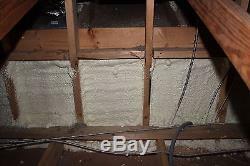 The item "Handi-Foam 1200 BF Closed Cell Spray Foam Insulation Kit (2 Kits 1 Gun/Hose)" is in sale since Monday, February 5, 2018. This item is in the category "Business & Industrial\Building Materials & Supplies\Insulation". The seller is "energy_efficient" and is located in Duncanville, Texas. This item can be shipped to United States, Canada.